Namibia, May - July 2013 - Klein Aus Vista, Garub Wild Horses, Kolmanskop and the Tirasberg. This lodge and campsite just outside Aus is an excellent base for this region. There are several walks starting from different places around the lodge grounds. We walked from the campsite to the lookout point over the plains to the West. 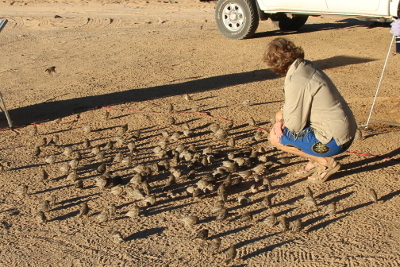 There were several sociable weaver nests around the campsite. Thisone had become so large that it had broken the branch. The sociable weavers were very friendly! 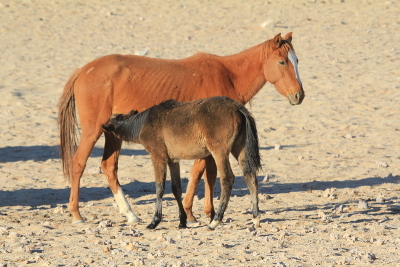 20km from Klein Aus Vista, at Garub, there's a waterhole which is frequented by so-called wild horses but they are probably ones that escaped at the end of the war and managed to survive and breed in this area. 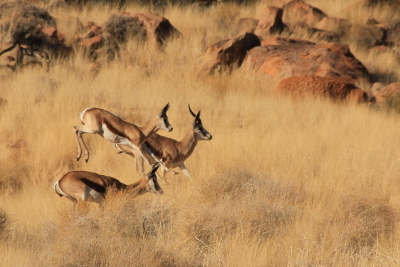 Horses, oryx and ostriches at the waterhole. 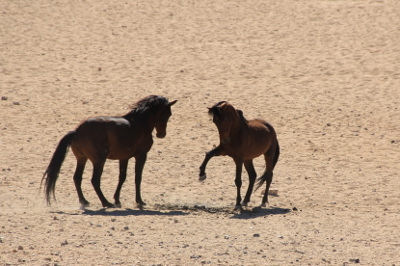 We saw quite a few stallions around the waterhole. Sometimes they would ignore each other but occasionally would challenge one another. Most of the horses were in reasonable condition but there wasn't much rain this year so the grazing is very poor. 3. 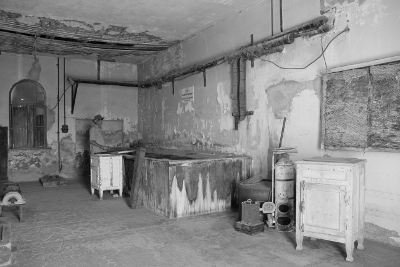 Kolmanskop Ghost Mining Town. 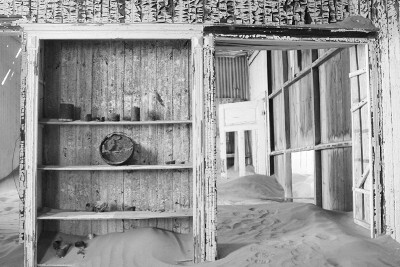 We had a day trip out from Aus to visit Kolmanskop which is near Luderitz, the entrance fee is N$65 per person. Last time we went on the tour but this time just wandered around on our own. 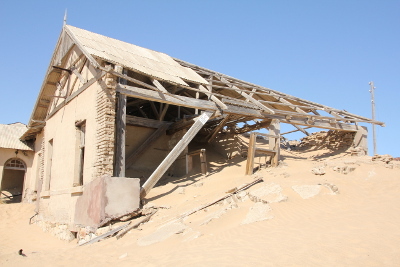 The houses are gradually being reclaimed by the sand. 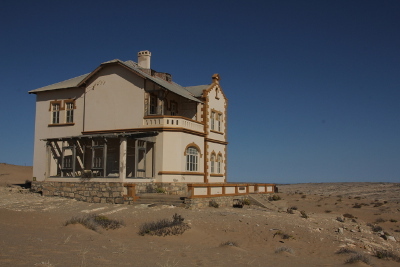 The mine manager's house has been restored. 4. 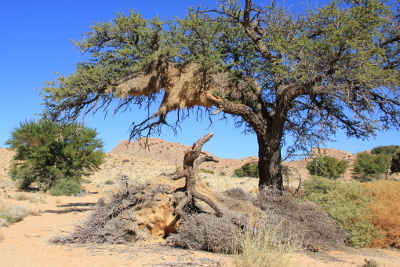 Namtib Biosphere Reserve, Tirasberg. This has to be one of the best campsite views! 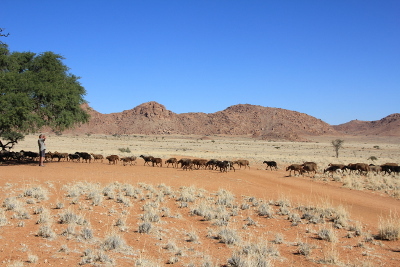 Namtib Biosphere Reserve is actually a working sheep farm - we saw over 1000 sheep passing by our campsite one afternoon! 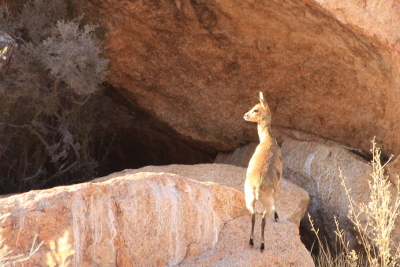 We saw several other animals on the farm - springbok, oryx, klipspringers, dassies and a water mongoose. We'd been told that if we followed a track up into the hills there were some pools so one morning we went for a walk. 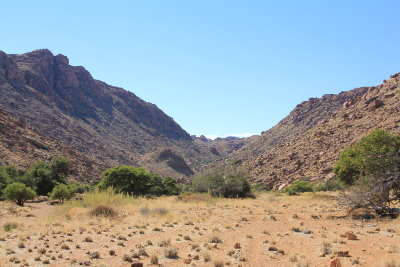 We followed the foot of the mountains until we got to a valley which narrowed into a gorge. The path became quite difficult to follow but we managed to find our way. The valley started narrowing before becoming a small gorge. We were surprised to discover a concrete pool which had been build in the gorge. Sheep as far as the eye could see! Some of the 1000 or so sheep passing by our site.